When I am teaching I am often asked about oils and fats and which are healthiest to use when cooking or preparing food. The answer is “it depends”. There is a huge variety of oils on the market which can make it a challenge to decide what to use and when. The TV chefs might be using a particular type of oil with gusto. You may have tasted something delicious in a restaurant and want to replicate it at home. Are roast potatoes cooked in duck fat a guilty pleasure? I have a particular food memory from my childhood in Austria of the wonderfully oleaginous emerald green and nutty pumpkin seed oil drizzled on the orange pumpkin soup. Having researched this topic, there are arguments raging on the various health benefits of oils, and the cooking uses. The scientific research contributes a number of different interpretations around the world, which are often controlled by local legislation and health advice. Firstly, what is the difference between oils and fats? Oil is the melted form of a fat. Some oils are better at cooking at high temperature than others and each oil or fat has a temperature at which it starts to smoke. This varies depending on the oil, for example refined vegetable oils such as sunflower or rapeseed oils which have a smoke point of 205⁰C; animal fats such as duck fat are 190⁰C; and butter has a smoke point of 150⁰C, unless it is clarified (ie the milk solids are taken out) when the smoke point reaches 200⁰C. The heating of an oil or fat will change its chemical structure and this is where health advice will apply as mono/poly, un/saturated fats and antioxidants are converted or damaged by heat, which in some types can result in carcinogenic properties. It’s best to use oils once only for frying, as it becomes unhealthier the more times you heat it. You must dispose of large quantities of cooking oil responsibly; most local recycling/waste disposal sites will have provision for cooking oil. Flavour comes into the discussion too. Fat is flavouring; it is not just for cooking with, so think about what you are using the oil or fat for. Meats contain levels of fat, think of the beautiful marbling of fat in a piece of lamb, which will baste the meat as it cooks. If you see a recipe that calls for both oil and butter, the butter is there to enhance the flavour. 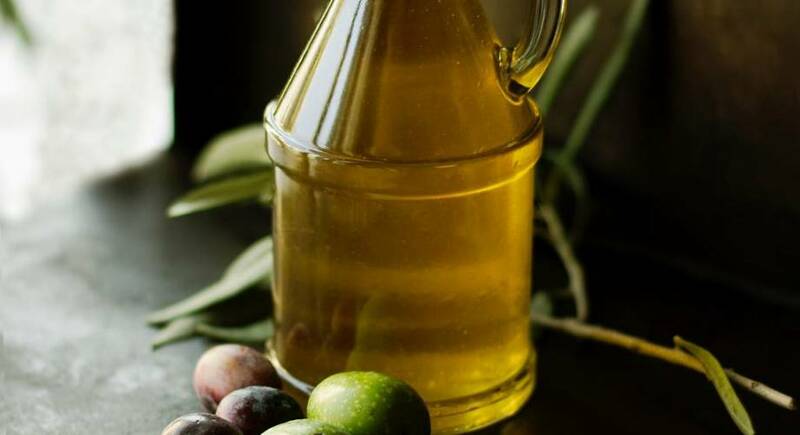 If you have an extra virgin olive oil, which will have a distinct flavour of grass and pepper, you may not want that affected by the cooking process and a salad dressing or drizzle of this oil is the best use. You wouldn’t use olive oil to cook an Asian dish as the flavours will not complement the other ingredients and a neutral oil is a better option. Olive oil has been used for millennia with uses ranging from medicinal to cooking and religious rites; it is mentioned in Homer’s Iliad and Odyssey and other ancient texts. It continues to be the main cooking oil of the Mediterranean diet. Elizabeth David, the famous cookery writer, introduced it to the UK in the 1960s, however it was not readily available outside an Italian deli or a chemist until the ‘80s. Olive oil is very healthy. It contains more mono-saturated fat than any other oil at 15%. This is the type of unsaturated fat that lowers LDL the “bad” cholesterol and raises the HDL the “good” cholesterol. The polyphenols in the oil act as antioxidants. It has a low smoke point which affects the quality, the flavour and the health benefits of the oil. Rapeseed oil is becoming more popular in the UK and can be found in supermarkets rather than at health food shops or delis. Those sulphurous yellow coloured fields that we see in the summer are full of the plant which gets transformed in to rapeseed oil. It is very low in saturated fats (only 7.5%), high in vitamin E, and high mono-unsaturated fats. It is the only unblended oil that can be heated to a high frying temperature without affecting its flavour or the antioxidants. Coconut oil has been promoted as a healthier fat; however there have been some strong counter claims. It has a high smoke point, and can be used as a substitute for butter which makes it popular with those following a vegan or lactose free diet. However, it has one of the highest levels of saturated fat at 86% (compared with butter around 52%) which means 2 tablespoons of coconut oil represents 19g of saturated fat. The daily recommended amount of saturated fat is 20g for a woman and 30g for a man. Goose or duck fat are a real treat and should not be used for everyday cooking as it is high in unsaturated fat. We generally only use it for roast potatoes and parsnips at Christmas as the fat adds flavour to the vegetables. It is also used, if you’re brave enough, to make a confit dish, which involves cooking meat very slowly, submerged in lots of duck fat. Delicious oils such as walnut, truffle and pumpkin seed are best used for drizzling or dressings. Sesame seed oil can be used for dressings and stir fries, but add it at the end of the cooking process as it burns easily. Truffle oils can vary in strength and can overwhelm a dish if used too liberally. Despite the main health benefits of oils and their delicious flavours, unfortunately they are all high in calories, so choose wisely!